Do you ever see really expensive, fun jewelry out in shops and think, “I could make that!”? Today we show you how! Create something special for yourself or others this holiday season… If you don’t have time to make it this year we also have a couple of great shop features today! Clemence from Oh the Lovely Things shows you how to create a statement with these easy-to-make Leather Bow Cuff Bracelets. This Frame to Jewelry Holder tutorial from Angel at TaDa! Creations uses an IKEA frame, but any frame will work. Carrie at This Mama Makes Stuff created these Chrochet Doily Necklaces for her friends. Make a pretty Rosette Bracelet with Heidi from sew.craft.create. We love these Fabric Button Earrings from Sada at Casa de Lewis (there’s a link in the post to some other great DIY earrings too!). Sada is a photographer in San Antonio, TX, newly married and working to decorate her first home. The Daisy Makeup Bag is an exclusive project download for Sew,Mama,Sew! from For the Love of Hand Stitching with Jan Constantine. Pair it up with some jewelry and you might just make someone really happy this holiday season! These mint green Greek Leather cord Bangles are made with really soft leather; each set contains 12 bangles with a silver plated tube. Find these and much more at Maribelle Campa, and for a limited time you get $5 off any leather bangle purchase in the shop so hurry over! Make Pillow Boxes with the help of Kiki from Kiki Creates. They’re the perfect way to wrap up some handcrafted jewelry! Celebrate the Irish countryside and create one-of-a-kind knitted projects. The patterns found in Contemporary Irish Knits showcase traditional Aran knitting patterns to create the more fitted and flattering shapes that modern knitters prefer. 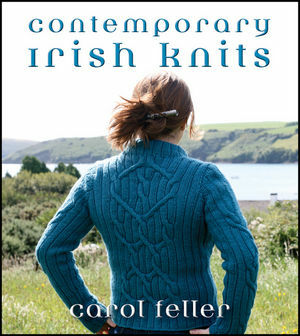 You’ll get 18 patterns for making one-of-a-kind Irish knits, encapsulating projects for women’s, children, and men’s wardrobe pieces, and accessories like bags, blankets, and shawls. Plus, you’ll get easy-to-follow instructions and guidance on how to construct and enhance your knitting experience to make for a more intuitively put-together knitted item. If you think quilting is too difficult or too complicated, you’re not alone. Cutting hundreds of pieces and joining angled seams can be tough work! But log cabin quilting, an artful and simple way to piece strips of fabric around a central square, is different. From the intuitive construction through the straight-line stitching, this style of quilting is simple as can be. * 21 signature applique & embroidery designs from popular designer, Jan Constantine. * Learn basic applique techniques as well as a range of easy-to-master embroidery stitches. * Jan’s bold and playful imagery will complement any home. In this collection of projects, Jan features an inspiring mix of style-romance, nostalgia, patriotism, and celebration. Update your home with elegant new colors and chic accents. Choose from pillows, a quilt, a throw, place mats… Even aprons and totes too! The Green Bag Lady has given away over 18,000 free shopping bags! She has a great super-simple pattern to make your own gift bags in this PDF. This week in our Handmade Holidays series Teresa is giving away a set of 12 fabric holiday gift bags to TWO lucky winners! Vicki Bellino, the creator of Bloom Creek patterns, presents 14 of her top-selling designs! Combine traditional patchwork with delightful appliqué shapes in projects ranging from wall hangings to bed-sized quilts–plus a great tote bag and pillow. * Use precuts; many projects are perfect for convenient 5″ squares, 2 1/2″ strips, and fat quarters. * Enjoy popular designs featuring fresh, new fabrics for a completely updated look. * Find something for everyone–quilts are easy enough for beginners and appealing enough for advanced quilters.